Just like humans, dog teeth and cat teeth require special attention. One of the only differences between people teeth and pet teeth is that most people generally have 32 permanent teeth, while most adult dogs have 42 teeth and adult cats have 30. Cats and dogs use their teeth and mouth to get through the world in ways their human counterparts never will. Unfortunately, they also face some of the same teeth issues and dental problems, including dental disease risks, as people. So, to help you have a better understanding of your pet’s teeth, mouth and gums, here are the anaswers to some of the most common questions we get about dog teeth and cat teeth. When Does Their Baby Teeth Fall Out? Baby teeth fall out at different times, depending on the breed. But, generally, pets begin to lose their front teeth at around 14-16 weeks of age, with other teeth falling out in later months. For example, the canine teeth typically fall out when a cat or dog is between 4-6 months old. What’s the Most Common Reason For Dental Work? The most common problem that requires pet dentistry work is periodontal disease, which is an inflammation of the gums. Depending on how severe the gum disease is, just the gums may be affected or the entire support structure may be affected. 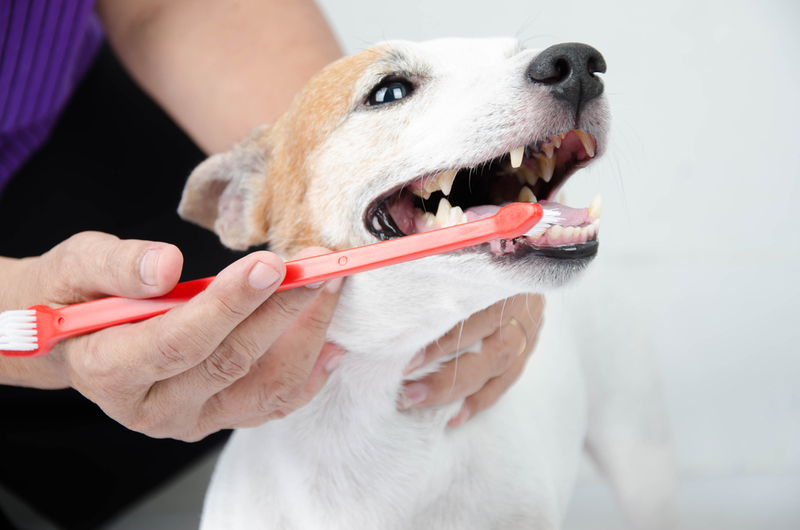 Brushing and routine visits to your Tierrasanta vet may help to prevent gum disease. Signs of periodontal disease may include bleeding, infection and bone loss, which require extensive dental work from a veterinarian in San Diego. What Happens if My Pet Breaks a Tooth? If the pulp or root is exposed after breaking a tooth, your San Diego veterinarian will need to extract the tooth or do a root canal. When dog teeth or cat teeth break, it will cause them a great deal of pain at first, however, as the root dies, their pain lessens, which is why it’s sometime difficult to know if they are in pain from teeth issues. Can My Pet Get Cavities? Dogs and cats don’t usually get cavities; however, there are several other problems, such as abscesses, tooth loss and periodontal disease that may affect your pet’s oral health. Are Bones and Chew Toys Safe For Pets? Chew toys are generally safe for your pet’s teeth and in many situations may help to strengthen their teeth. However, chewing on things such as bones and sticks can cause significant harm to not only your pet's teeth by other physical damage as well. Contact Tierrasanta Veterinary Hospital to learn more information about oral health care for pets. Call 858-292-6116 to schedule your pet’s dental cleaning with our veterinary team in San Diego.